It's that time of the year again and we're are loving these warmer days! Bring new life to your summer with these cool and easy activities you can do with family and friends that will beat boredom at any time! Water balloon pinatas: This twist on the traditional pinata game is super fresh! We guarantee you'll have so much fun while fighting the heat away! You will just need a few balloons and rope. 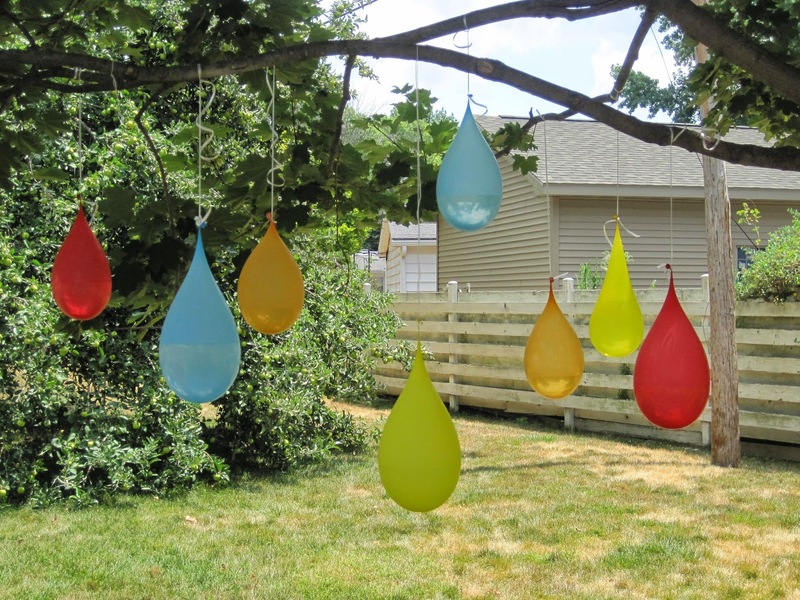 Fill the balloons with water and then hang them on a tree branch with some rope. Invite family and friends to the backyard and cover their eyes with a blindfold. Bust the water balloons with a stick and enjoy! Rope Course: A rope course will keep your kids active and entertained! The best thing is it doesn’t have to be complicated or expensive! It is also a great opportunity for you to be creative! Kick croquet with hula hoops: Do you have some old hula hoops gathering dust in the basement? Well, it's time to give them new life! Cut the hoops in half to make wickets. Grab a beach ball and let the fun begin! Let's get started! Paint the boxes with the spray paint to make them look like ice cubes and stones. You can even add more details to the boxes with the brown paint, by painting cracks on the boxes. Now, onto the bouncy balls! Customize each ball with the characters' faces by printing a template of each face and then drawing them or pasting them on the bouncy balls. To make it more fun, use a launcher to make those birds fly! You will need 2 people to hold the straps, so taking turns it's recommended, so everyone can play. Just like in the mobile game, each player will have to launch the full set of birds before moving on to the next player. Whoever can knock down the most bad piggies wins! BBQs are a summer favorite! This year, skip the traditional hot dogs and burgers and try some of these flavorful recipes: They will have you licking your fingers! Fajita Chicken Kebobs: These are not only delicious, they can be considered healthy too! Season the chicken with fajita seasoning and pair it with summer veggies like onions and bell pepper. Grilled Vegetable Pizza: Your vegan or vegetarian friends will love this one! Bacon Grilled Jalapenos: Indulge yourself with this tasty recipe: Stuff some jalapenos with bacon and cream cheese and put them on your grill! Grilled Pineapple with Cinnamon Honey Drizzle: This sweet treat is the perfect dessert for your BBQ. Put some pineapple slices on the grill and drizzle them with a concoction of cinnamon and honey. Yummy! Water games in your backyard are refreshing and it's also a great family activity! Children will love these water game ideas! Water-gun tag: This is a spin on the traditional laser tag game. Get your water guns and try to tag the other players with a cold splash! Water Slide: You'll just need a tarp, a hose, and shampoo. Yep, that's it! Water Limbo: This unlikely match will bring tons of fun for people of all ages and heights! Camping is another family favorite activity for summer! It's the time to explore and get in touch with nature. The cool thing about camping is that you don't need to travel far away to camp, you can even do it in your own backyard! You don't need a reason to have a fiesta! Everyone loves breaking a pinata and candy, right? For your next family bash, get a summer themed pinata, blindfold your guests and make them take turns at swinging for the sweet, sweet prize!